In the Bible, Moses sang. Miriam sang. So did Deborah, David, Mary, Paul, the angels, and so many more. The Israelites went to war singing; they sang over victories and deaths, over happy moments and hard moments. They knew something we've lost sight of: When we learn to sing God's words back to him, we align the deepest spaces of our hearts with the deepest places of his--and we experience breakthrough. So why do we relegate singing the Word to just worship teams? 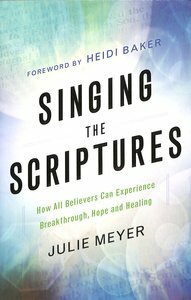 About "Singing the Scriptures: How All Believers Can Experience Breakthrough, Hope and Healing"